Bully behavior in schools has been identified as a public health crisis. It has become a focus point for many schools and there have been many discussions surrounding solutions that will not only resolve bullying but prevent it from ever happening in the first place. In my work, I continually hear that educators and caregivers continue to struggle with finding the “right” solution that will engage teachers, staff, students and parents in helping resolve bullying issues at their school campus. So, today, I am starting a new blog series designed to help you launch a program at your location or elevate an existing bully prevention effort. Today we’ll introduce some ideas for you to start thinking about. Then, each week, we will go into more details about each item on the list. Remember…every campus is different and there is no “one size fits all” solution when it comes to effective bully prevention. The good news is that these recommendations can be tailored to fit any school culture. The other good news is that it isn’t necessary to launch these ideas all at once. Not all the recommendations we will be talking about have to be initiated at all. It really depends on the specific challenges a school is facing and how much time and effort the school administration and parents can commit to the effort. One of my favorite sayings goes like this…. Implement a school wide bully prevention program. Survey teachers, staff, students and parents to get feedback about the state of school morale and culture. Initiate small changes that will lead to big results. Recognize and identify the students that are at most risk for potentially becoming bully targets. Create programs that will reach not only the bullies and the targets, but the bystanders and followers as well. Design training and curriculum that educates teachers, staff and parents about topics like defining, identifying and reporting bully behavior, safe intervention procedures, and behavior modification. Develop a strict “No Bullying” policy that everyone involved can understand and follow. Create a system of anonymous reporting that will encourage everyone to say something when they see something. Integrate bullying education into everything that happens at your school. Foster a sense of community and engagement between educators, staff, students and parents. Involve the larger community in your bully prevention efforts. Determine what markers you will use to measure/monitor the success of your efforts. 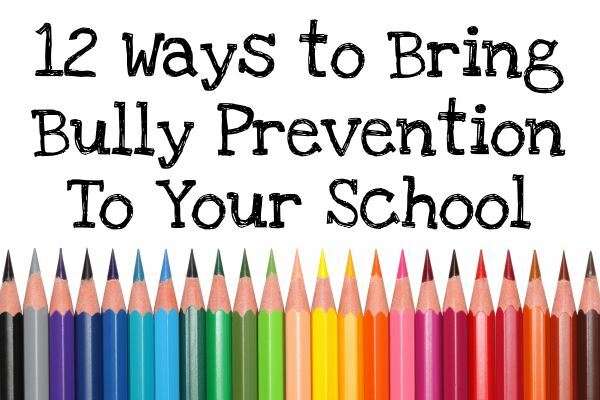 By now, you likely have a general idea about how you can make a difference in your school and community to reduce the incidents of bullying and bring a greater sense of community at your school. Over the coming weeks, I will post more blogs detailing what to consider when developing any of these ideas at your school. Don’t stress out trying to figure it all out at once…enjoy the process and remember the big picture…changing school culture is not a one-time event and it may not happen overnight. But you can make small changes quickly that will add up to big results and great rewards for everyone involved!